On June 30th, while vacationing in the Turks and Caicos, a 28 year old man was bitten by a large shark. This particular attack got my attention in a hurry. For the first time in my life, a friend of mine was bitten by a shark. Obviously I know some shark biologists who have been bitten while handling sharks in the field, but that isn’t what happened in this case. This victim was simply snorkeling during a vacation. He agreed to answer some of my questions about the incident, and prefers to remain anonymous. Because he knows me and several other marine scientists, the victim was more educated about sharks than most people. He wasn’t afraid of them before this incident. ” I was never kept out of the ocean because of a fear of sharks. I’ve always known they were there and just assumed that if I wasn’t doing anything to purposefully provoke them then the odds were in my favor,” he said. As is often the case, the attack didn’t change his view of sharks. It’s one thing to hear about a shark attack in the news when the victim is someone you don’t know. While most of us sympathize to an extent with any misfortune that befalls a stranger, a tragedy affects us much more when someone close to us is the victim. In the past, my reaction to hearing about a shark attack in the news was to criticize the media for promoting needless fear by focusing on an extremely rare incident and to point out that people are, on average, more likely to be killed by a lightning strike or a bee sting than a shark attack. While these facts remain true, I now know what these attacks feel like for the family and friends of the victim. While attacks are statistically unlikely and that media coverage of them is harmful to the marine conservation movement, the victim and their loved ones have experienced major emotional trauma. Now that I know that my friend is ok, I hope to learn from this incident and to become a better advocate for sharks because of what I learn. Just curious, is there any idea what type of shark it was (maybe a bull shark)? I’m glad your friend is okay! It’s often difficult to identify to the species level. All they know is that it was a Carcharhinid. Could have been a bull, could have been a blacktip, could have been a Caribbean reef, could be something else entirely. Fantastic example of this man’s rationality and perspective. It’s refreshing to see an article portray a respectful image of these creatures whose habitat we are invading. Well done to this guy, I hope his story reaches far. Sorry to hear about the incident. Why does your friend not say where it happened exactly? And how does he know it was a shark and not, for example, a large barracuda? A sneak attack would be typical of barracuda. Also, 30 June is during nurse shark mating season. It would be helpful to know more so those of us who snorkel in TCI can be aware of the possible risks and also try to identify the likely culprit. Did you see the picture, Frank? It’s clearly not a barracuda or nurse shark bite. Yes. I did, David. And I am not persuaded it is a shark bite. Looks more like a large dog bite or a close encounter with barbed wire. A shark with a mouth that large should have taken off a chunk of flesh not left scattered cuts and a weal. In islands with a tiny population this sort of thing is big news. If it happened in TCI the diving and medical community would know about it. So would I. So would Chris. Hi, the size of that bite looks more like a Bull shark maybe? but I am sorry to hear about your friend. Do you know where in TCI this happened? I was a research assistant for a project tagging sharks around South Caicos a few years ago and am curious. Whereas I am not questioning that it is a shark bite or the that the story is true I would like to however know as to how a serious incident like this occurred on the island without any of its inhabitants hearing about it! As a resident and diver who has friends in the medical community I can assure you that on an island where it is impossible to keep a secret, that an incident of this magnitude would have been front page news. Did the person in question stitch themselves? Have the requisite Scouts badge for medical first aid? Sorry if I sound too sceptical or sarcastic but careless stories can cost people their livilihood and on an island such as the Turks & Caicos, tourism is very important. The last thing they need is a ‘Shark Attack’ scare story to convince people incorrectly to change destinations. In my time diving and snorkeling in the Turks I have swam with Reef, Nurse, Lemon, Hammerhead and even a Tiger shark and have managed not to have been nibbled once. I suggest a bit more research on the origins. Are you seriously claiming that this shark attack didn’t happen because you didn’t hear about it before now? I trust the Global Shark Attack File experts that documented the incident a lot more than I trust your “friends in the medical community”, who shouldn’t be talking about patients anyway. I agree with Chris. Something like this would have been all over the islands before the last stitch was in. That’s why I ask where it happened exactly. Also, yes I did see the wound and judging by the shape and size there should be injuries on his chest. A shark large enough to inflict these wounds would have had this man’s head inside his mouth. Look at the curve. This was obviously a bad experience but the scattering of wounds is just not consistent with a shark bite. It’s more like the sort of wound which might be caused by falling into barbed wire or scrap metal. You can see its a shark bite and its obvious he has had stitches,I am glad your friend is alright and hasnt changed his mind about helping the sharks still,he has respect for them that I can see from what he wrote. Anyone can see the wounds and the stitches. There is nothing about them that makes them distinctive as shark bite wounds. Look at the shark bite images on the web – not the amputations or serious injuries. No similarity. The notion that this can’t be a shark bite because you didn’t hear about it when it happened is silly, as is the notion that this can’t be a shark bite because it doesn’t look like some other shark attack photos you looked at on the internet. The photograph in this blog post was taken several weeks after the bite, for the purpose of this post. The wound healed since the incident. At the time of the incident, shark expert Ralph Collier examined photographs and concluded that it was a large carcharhinid shark. A Global Shark Attack File research team agreed. He was bitten by a shark. It happened. There isn’t doubt that it happened. Silly doesn’t mean wrong. OK. Now I know the location where it happened I am even more certain that this is not a shark bite. There is a big swell and strong current and there are very sharp rocks protruding out of and overhanging the water. Visibility is difficult near the rocks because of the crashing waves and surf. Misjudgement of distance and strength of current could easily have led to these injuries. I have no reason to deny the general possibility of a shark attack in these waters but I do think that sharks get a bad enough press without blaming them wrongly for something like this. It is notable that the victim himself initially thought he had hit the rocks. I think he did too. I think he went under to look at the bottom and he was lifted by the current into the overhanging rocks. I would like to know if Mr Collier actually saw the rocky outcrops where this happened. Because unless he did or a tooth was found embedded in the wounds he was not given all relevant information from which to draw a well-founded conclusion. I’ll tell you what, Frank and Chris. I’m willing to contact Ralph Collier and the head of the Global Shark Attack File and ask them to weigh in on this. If they tell me that there is any reasonable doubt that this is was a shark attack (which is not what it says in their official report of the incident), I will give both of you a well-deserved public apology. If they reiterate what they said in their official report (i.e. based on the evidence there is very little doubt that this was a shark attack carried out by a large carcharhinid), then I’m going to consider the matter resolved. Certainly shark attack is undesirable, especially given bad press sharks receive already. Many people already have a knee-jerk reaction whenever the subject of sharks is brought up. Therefore, when someone who works with sharks, and has made a career in the field believes a wound is a shark bite, I would tend to agree. Especially as the victim was a known friend of the author of the post! Yep. Sounds good to me. 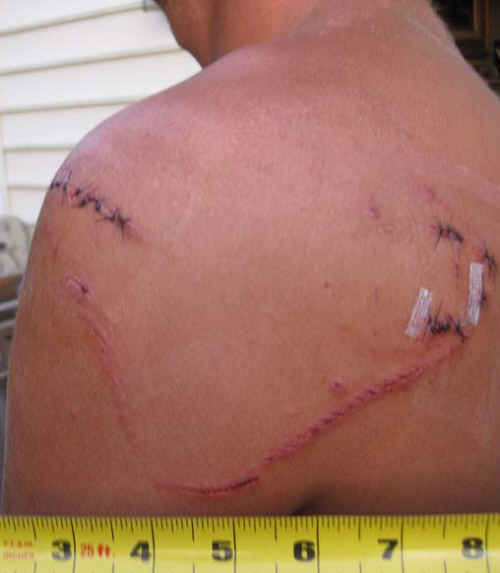 While you are asking him, I would like to know what is so distinctive about these wounds that makes it more likely that a shark was responsible for them rather than a close encounter with rocks, for example. As for Jack’s comment, at the risk of sounding cynical, it’s a lot more macho to be wounded in a shark attack rather than in a clumsy snorkelling experience! Also, I know the location of the incident, and last time I was in the water there steered well clear of the rocks precisely because of the risk of injury. Hello. As TCI residents and divers we are interested in this, also. I don’t see any evidence that this is a shark bite. While not knowing where this happened, I do know the typical undercut, overhanging ironshore limestone here. I can well imagine a swell lifting a snorkeler up against some sharp rocks and the current taking him a few feet away from them before he realized he was bleeding. A shark with a mouth big enough for those wound spacings…..well I have a hard time believing something THAT big would get THAT close ( six inches from your ear?) and you would not see it in these crystal clear waters in the TCI. Visibility here is typically well over 50 ft. How big a shark would this be? Ten feet long to have mouth that opened that wide in either dimension? And yet the injured snorkeler never saw even a flash of shark? It had to have swam by his head. In crystal clear water. It didn’t then disappear in a puff of smoke. Secondly, sharks don’t bite like that. They don’t peck so fast and then leave so fast you never see them. They bite, and shake their heads back and forth, and their bite wounds tend to be pretty continuous. Not with gaps like the shark was missing big blocks of teeth. And where’s the rest of it? A bite traps a body part between two opposing jaws. A pincer. Like being caught in a large shear. If the marks we see in the photo are the sum total of the lacerations, shouldn’t the one on the shoulder be turned 90 degrees to line up with the ones on the shoulder blade? This shark must have been part boa constrictor to unhinge a jaw like that.If I mentally subtract the long scrape mark, which looks like someone was drug across a sharp object by a wave, and just look at the position of the sutured lacerations alone, and their relationship to each other….it doesn’t look like a bite of any kind. The curve of the scrape seems to suggest something, but that’s not where the punctures are. If this was a single chomp, there should be an easily identifiable jaw pattern in the punctures. There isn’t. Sorry, but I don’t see it. Please point it out. Sketch the position of the shark’s jaws over those punctures for me. Please. I can’t make it work. And the comments about the local medical profession are spot on. Whether someone in another country thinks it’s right, or wrong doesn’t matter. You’re getting your medical profession confused with ours. Nurses would have been picking up their cell phones before this guy even got back to his hotel. Their husbands/brothers/nephews/sons/cousins/neighbors/friends take small boats out to dive for conch and lobster, and are terrified of sharks. Or they work for a dive boat operator and know they would want to know about this rogue killer. Or their kids go to the beach a lot. And they will tell someone about a shark attack, if there is any reason to believe there has been one. This tells me that nobody involved in the local medical community thought it was a shark attack at the time. It would have made the newspapers. Shark problems are THAT rare here. With probably over a hundred visiting divers in the water here, every day of the week….we get zero cases of sharks being overly confused by bubbles and hitting like a wahoo and disappearing without being seen. A shark hitting into bubbles near the shore would be coming from underneath, anyhow. Right? Otherwise he’d hit the rocks. Or have to reverse direction right in front of our snorkeler, who didn’t see him. A shark would be looking at his prey, so he’d hit legs. Not back. Or did one of our famous flying sharks leap off a cliff and land on a snorkeler’s back? I’m sorry your friend got hurt snorkeling, but I don’t see any evidence here of a shark attack. And it sounds like your friend didn’t report it that way to whomever sewed him up, either. I think his initial assessment was correct. Byron – According to Global Shark Attack site it happened at Mudgin Harbour, MC. There seems to be little fact checking on that site though. You just file a report and it gets noted. I did the geometry also and like you, couldn’t make the wounds fit. If the weal is part of a shark wound, the chap’s head and other shoulder would have had to be in the shark’s mouth. Why are no wounds on his chest either? Attack of the Internet “experts”!!!! Byron, while I appreciate any comment on the blog, several statements that you’ve made are factually wrong. I’ve interacted with sharks on four continents, and sometimes they can sneak up on you. The aquatic habitat is three dimensional, a mask restricts your visibility, and sometimes you’re just too focused on the inch-long pretty nudibranch to notice anything else. No, Ralph Collier estimated that the animal was 5-6 feet long. Sorry, but no. The overwhelming majority of shark bites on humans are “hit and run”, where the animal takes a small “test bite”, realizes that we aren’t desirable food, and swims away really fast. Many shark attack victims never see their attacker. Clearly he didn’t report being bitten by a shark, which explains how shark attack experts got in touch with him. Ah the internet, where everyone is an expert, except the experts. Hmm. What experts? People who shoot from the hip are not experts. Thank you. That’s a remarkably self-aware and constructive observation, and it’s refreshing to hear commenters acquiesce in the face of overwhelming evidence. Too often people become so entrenched in their own arguments that they fail to see when reason has galloped away. I hope you’ll use this as a learning experience and take the time to learn before committing to another hip-shot reaction. I’m sure the two shark attack experts and the shark conservation biologist appreciate this comment. Just wondering-Frank, exactly what experience do you have with shark attacks? Also…why start an online flame-war? Please, if you want to think things like this, keep them to yourself. But I’m pretty sure Mr. David has better things to do than argue with you about whether or not this was a shark. I contacted Ralph Collier of the Shark Research Committee, who has studied hundreds of shark attacks over the course of decades, and the research team at the Global Shark Attack File. They generously agreed to provide written statements explaining how they know that this is, in fact, a shark attack. There you have it. Two of the world’s leading experts on shark attacks have examined this case and shared their thought processes. The details of this case are very similar to many other cases around the world- a minor injury from a “hit and run” glancing bite. It’s settled- my friend was bitten by a shark. I have been waiting several days in the hope of a scientifically verifiable explanation from the so-called experts. What we have are opinions qualified by words such as generally, probably, appear to be etc. When passengers get in a plane they want to know it is going to stay in the sky, barring mechanical or technical failure or accident. Not probably or generally stay up there. If the best you can do is produce qualified opinions you cannot say your friend was bitten by a shark. At best you may say that a very small group of people think he was probably bitten by a shark. That does not exclude other possibilities and it certainly does not exclude the validity of my opinion or the opinions of those other commentators in this chain who know the waters of TCI. Southern Fried Science is a misnomer. No science discernible here. Ah yes, when all else fails, there’s always the ever trusty “ad hominem”. “A very small group of people” who have spent their entire professional lives studying shark attacks believes that he was bitten by a shark, because of the similarity to numerous other shark attacks, and the pattern of the bite which can’t have been created by anything else. In contrast, a very small group of people who know absolutely nothing about shark attacks believe that this wasn’t one because they would have heard about it if it was. Your criticisms of qualified words like “probably” and “generally” show a lack of understanding of science that isn’t really surprising considering how far you’ve jumped off the reality cliff in the rest of these exchanges. It seems none of you can stomach criticism or disagreement. You would all clearly prefer a monologue. You know absolutely nothing about those whom you insult except that we disagree with you, not just because we think we would have heard about this episode but because WE DIVE. WE SNORKEL. WE KNOW THE WATERS – and some of us ARE SCIENTISTS and we are capable of discerning bad science and a poor argument, which apparently, many of your fans, or is it your friends and family, who “like” your posts, can’t. Stop misleading your readers and peddling bad arguments as science. You’ll be pleased to know I am bored with the quality of discussion (not) and invective here. Pity. The site looked promising. Aw, Dave, you hurt Frank’s feelings. Now he’s going to take his ball and go home. Great article – thanks! And good debate!! At first I thought I was thrown into the rocks, but considering the speed at which the events took place, I can only rely on my memory which was admittedly a bit hazy, and the physical evidence. All I can tell you is that when I felt the “bump” I turned around expecting to feel and see rocks, but there was nothing there. I instinctively swung my arms around behind me as soon as I felt the bump and as soon as I realized there was no coral or rocks I b-lined right for shore. Also, I am well qualified scuba diver and overall good swimmer and surfer. The swell was not big or violent, or really very powerful in any sense that day. In fact, the waves were just rolling over a portion of the rocks and creating this large swath of bubbles that obscured any visibility. Granted, I agree snorkeling into low visibility wasn’t the smartest decision, but I was also very careful not to be near any rocks. If you had actually seen the wound, you would realize there was no way it was caused by a scrape into the coral structure. As a scientist, it took a lot to convince myself that it was a shark, but after looking at the symmetry of the wound…what coral has the exact spacing of teeth along the upper jaw of a shark, I realized it had to have been a shark. Not to mention there were no coral fragments in the wound or scrapes of any kind…injuries you would expect from being slammed into some rocks. Also, if you were to have seen the large wound on the upper portion of my shoulder, how cleanly cut it was and how all of the cuts were in the same direction as a jaw, I find it hard to believe that you have such a problem thinking it was a shark. The reason it didn’t bite my head was I was bending downwards, extending my neck and head below the plane my shoulder was at. And if you look at the direction of the bite, the bottom jaw at the top of my left shoulder you would realize, considering I was facing the rock outcrop, the shark was actually swimming away from any rocks, so it would have no problem evading running into land. And, just to add to the story, I was brought to a small private doctor who stitched me up and made no story about the incident because at that point I wasn’t totally sure as to what had happened. I didn’t really think to contact the local newspaper, or really have any desire…after dealing with that I really just wanted a beer. Another reason you may not have heard about it was that it took place in a pretty deserted beach along Middle Caicos. Honestly I don’t see this as an attack and more of an inquisitive bite. I think the shark was confused, or just curious and truly couldn’t tell what I was. I’m sorry you are so hard off to believe the scientific conclusions of experts and honestly Frank, the fact the you don’t believe the word of two shark bite experts and base your evidence off of one photograph and a story that really doesn’t have most of the details makes me glad you are not a scientist.